An anti-ageing formulation utilizing protein rich compound and a blend of pure herbal extract and vitamin B which protects the skin and keeps it smooth, refreshed and renewed. With natures own super exfoliants it gently remove dirt, grime and excess oil cleanses pores and brightens complexion. Haya's Face pack leaves skin smooth and radiant. Make a thin paste with Haya's rose water, apply the mask eventually with fingertips on the face and neck except eyes and under eye area. Allow it to dry for 20-30 minutes.Rinse well and pat dry. For better result use twice a week. 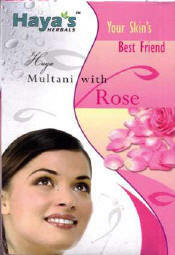 For best results use with Haya's Rose Water.